I enjoyed visiting my brother at Bournemouth University and followed him there to study Accounting and Finance. 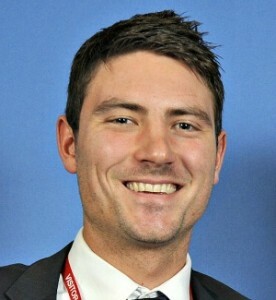 I had no intention of becoming an accountant but I wanted to start up a business myself one day and I knew that elements of my course would be really useful, particularly work around small business finance. It was a really practical course, with lots of case studies, putting what I was learning into a real world context, in companies I knew about. But I wasn’t sure what business I wanted to start. I enjoyed gardening with my parents growing up and whilst at University I worked at Europe’s most innovative nursery, Architectural Plants. The owner, Angus, is a real entrepreneur – always pushing boundaries and trying new things. I had the idea when I was working there of using gardening to help unemployed young people gain skills and get into work but wasn’t quite sure what it would look like. After graduating I wanted to do something no one had done before and decided to row across the Indian Ocean with a friend from home, Andy. It was a bit like running a business; we had two years of research, planning, training and fundraising, and then after three months of rowing, we did it, breaking two worlds records in the process! I am good with ideas and am not afraid to try new things, but knew I needed Andy with me to actually deliver on it so it would work. Our rowing adventure was a catalyst for what happened next as it gave me the confidence to start Streetscape. I was working full time in sales and using my spare time to research and start building the charity with James, another friend from home. As with Andy, James really balanced me out and we make a great team. 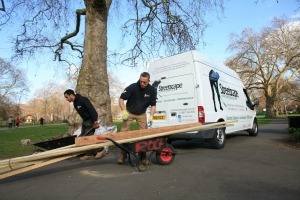 Using my sales background, I’d speak to people about Streetscape as if it already existed and gradually it took shape; the plan was to provide paid apprenticeships in landscape gardening to 18-25 year olds who were long-term unemployed, helping them to build the skills, experience and attributes they need to fulfil their dreams by moving into and retaining work. We were ready to launch but thankfully James suggested we ran a pilot project first. We found a client, Stepney City Farm, and took on three apprentices for three weeks. We created a design including planting and decking, and then we had three weeks to find the £17,000 to run the project! As a social enterprise we wanted to get our funding from businesses and individuals rather than relying on Government funding. Using the network I’d worked hard to build and my sales skills and a lot of persistence, we did it. We both took holiday leave from our jobs; we worked with our apprentices during the day and each evening we’d talk to them and continue to refine the model. That was the real turning point: the experience we gained made it possible for us to write a business plan that enabled us to go out for more funding, become a charity and get to where we are today. It’s an amazing feeling to think of what we’ve achieved so far. We now have 2 landscape gardeners, Luke and Jay, who each head up a team of apprentices who are employed full time. They work hard in the classroom one day every two weeks and the rest of the time is spent on a variety of landscaping jobs from small city front gardens to large estates. 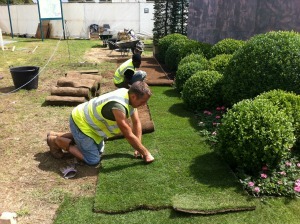 Our first job was working on a garden at the Hampton Court Flower Show 2011 where we won gold as secondary contractors! That was a massive boost but our overarching goal is always that each and every long-term unemployed young person to whom we provide an apprenticeship moves into and retains work following their time with us. Not everyone succeeds. It’s a blow when it goes wrong and someone doesn’t finish their training. Seeing the hard work, time and effort you’ve invested in someone being thrown away is tough, but it is so exciting to see the transformation in the ones who do complete their apprenticeships. It’s the most amazing buzz in the world. Jerone, for example, was part of the pilot project and then we took him on as one of our first apprentices. He’d never had a job before, but after finishing his apprenticeship he went straight into working for a maintenance company and is very good at what he does. He and others like him are now positive role models in their community. Now it’s well-established, I have more of a backseat role at Streetscape, focusing on business development and strategy. I have recently started a company that provides sales and strategic support to SME’s, working closely with the leaders of the business to help them to set and achieve specific targets. But I always want Streetscape to be there and maybe expand nationwide or even go international.